No Japanese Major League Baseball player has seen a similar level of success. As of this morning, it appears that Ichiro has played his final major league game. The Oakland As and Seattle Mariners finished a two-game series today in Tokyo, opening the 2019 Major League Baseball (MLB) regular season. Ichiro enjoyed one of the most remarkable careers in baseball history, bridging the gap between Japanese and American baseball in a way that no other player has. Ichiro (last name Suzuki, but he generally goes by one name) made his MLB debut with the Seattle Mariners in April 2001. Before joining the Mariners, he played seven full and two partial seasons with the Oryx Blue Wave in Japan, amassing an impressive record in the field and at the plate. In 2000 he decided to try the move to Major League Baseball, building on the successful transition of several pitchers. No position player of his magnitude had attempted the transition to that point, however. Michael Street offers a nice history of Japanese players in MLB; the unusual relationship between the leagues has required the development of a unique system for acquiring the rights to offer contracts to Japanese players. Although the process has evolved, at the time of Ichiro’s move to the United States MLB teams would issue competitive bids for compensation to the Japanese teams who held the rights to the player. The player would then be able to negotiate a contract with the successful bidder. Ichiro joined the Mariners just after the team had lost three of its four superstars (Randy Johnson, Ken Griffey Jr., and finally Alex Rodriguez; Edgar Martinez finished his career with the team). 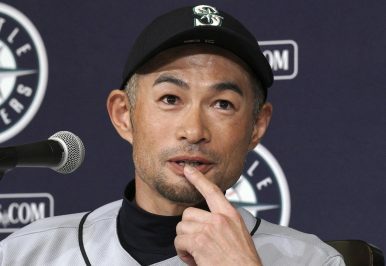 The Mariners were particularly appropriate for Ichiro, as they had extensive ownership connections with Japan. With Ichiro playing right field and hitting leadoff, that team would win a modern record of 116 games. Ichiro won the American League MVP and Rookie of the Year awards. Ichiro played 11 and a half seasons with the Mariners, before leaving for the New York Yankees in a mid-season trade. He remained with New York for two more years, then moved to the Miami Marlins through free agency. He rejoined the Mariners last year, entering semi-retirement after 15 games. Unfortunately, Ichiro appeared in the post-season only twice, losing in the 2001 and 2012 AL Championship Series. However, he did help lead Japan to victory in the 2006 and 2009 World Baseball Classic international tournaments. For a modern player Ichiro had an idiosyncratic profile, drawing few walks but hitting for a high average and showing lightning speed on the base paths. Over the course of his career he amassed 59.3 Wins Above Replacement (a statistic that aggregates value in comparison with a notional “replacement level” player available in the minor leagues) and 3,089 hits. Solely on the strength of his MLB numbers, Ichiro would have a borderline Hall of Fame case. However, because of his role as a pioneer, and because he spent several season in Japan when he could otherwise have accumulated statistics in the United States, Ichiro should have little trouble making it into Cooperstown. It is impossible to estimate cleanly what Ichiro’s career might have looked like if he’d spent his entire career in the United States. One effort suggested perhaps 800 more hits and 10 or so WAR, which would have made Ichiro a clear hall of famer by modern standards. No Japanese player has seen a similar level of success. Indeed, the only other Japanese position player to see sustained success in MLB was Hideki Matsui, an outfielder with a much different skill profile who played for most of his career with the New York Yankees. Currently six Japanese players are on MLB rosters, including most notably pitchers Yu Darvish and Masahiro Tanaka and two-way sensation Shohei Otani. Otani, one of the only players in modern history to play a regular position in addition to a spot in the pitching rotation, had an enormously successful rookie season despite a serious elbow injury, and at 24 is the most tangible representative of Ichiro’s legacy as a pioneer. His legacy as an ambassador of baseball, of sportsmanship, and of class can never be matched. Major League Baseball: Meet Japan's All-Time "Hit King"
Ichiro Suzuki fully deserves his place in the firmament of baseball stars. Samurai Japan Take on the MLB All-Stars … and WinAsia and the World Baseball ClassicSouth Korea, Japan Dominate Little League World SeriesYankees Pay $175 Million for Japanese Ace TanakaCould Masahiro Tanaka be MLB’s Next Japanese Sensation?